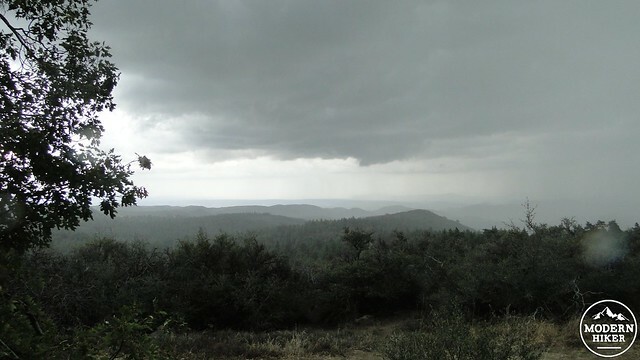 The Laguna Mountains Recreation Area offers a massive network of trails that allows the hiker to piece together tremendous loops encompassing soaring desert views, cool pine forests, vast meadows, and rugged hillsides. But not every worthwhile hike in the Lagunas is an epic, nor is every worthwhile hike directly connected to the network. The most notable exception is the nature trail at Wooded Hill, which follows a figure-8 loop up to the 6,223′ summit. 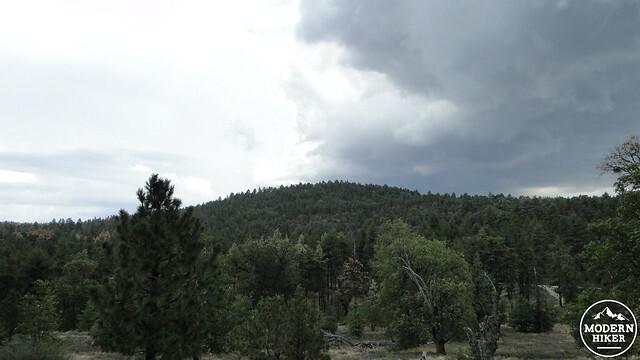 The hill features some of the densest and coolest forest in the Lagunas, along with great views to the south and some of the best fall color in the county. 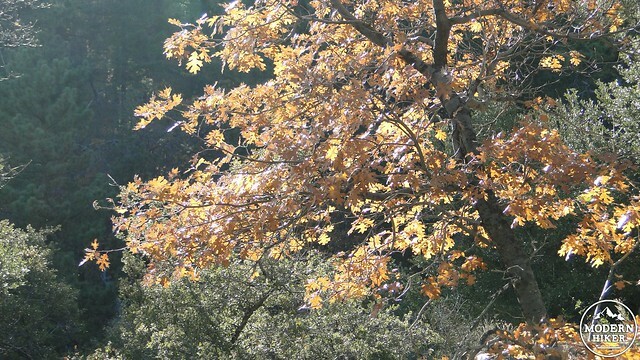 The fall color on Wooded Hill comes primarily from the California black oak. This deciduous oak’s leaves turn a vivid gold in the period from late October to late November. There are a large number of these oaks on Wooded Hill interspersed with vanilla-scented Jeffrey pines. While the fall color of the black oak is notable, it also produces a surprising color show in the Spring as well. Every April, the tree’s re-sprouting leaves emerge a vivid pink that slowly transitions into a bright green by mid-May. Although Wooded Hill is nice at any time, April-May and October-November are definitely the best times of year to visit Wooded Hill. This hike would also be especially fun following a winter snowstorm. The short distance and modest elevation gain combined with the cool, shady forest make this hike great for families and individuals of most skills and abilities. A pamphlet (usually) found at the trailhead provides information about the numerous sights on the trail. 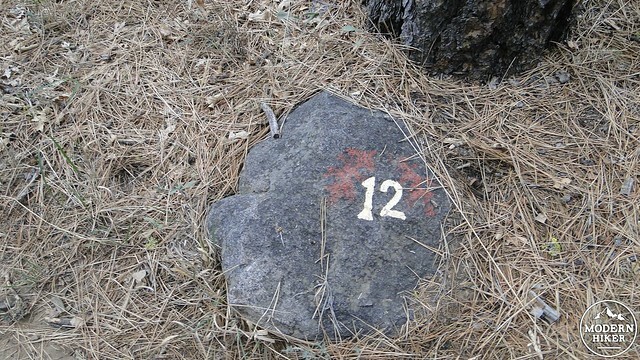 Rocks painted with a number corresponding to the item in the pamphlet indicate where to stop and refer to the guide. The trail begins at a small parking lot directly opposite from the Wooded Hills Group Campground (available through reservation). There is an “entrance” trailhead on the left, while the “exit” trailhead is on the right. Neither is specifically marked as such, but if you are following the pamphlet or the GPS track offered here, you will take the trail on the left. As you step onto the trail, you plunge into the forest. If you come during the middle of a warm spring or summer day, you might catch whiffs of a vanilla scent. 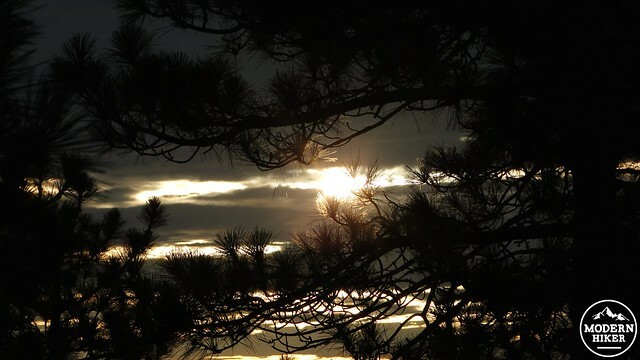 This scent is caused by the sun’s warmth “baking” pine needles and the bark of surrounding Jeffrey pine trees, causing the dispersal of a chemical compound called pinene (or Alpha-pinene). 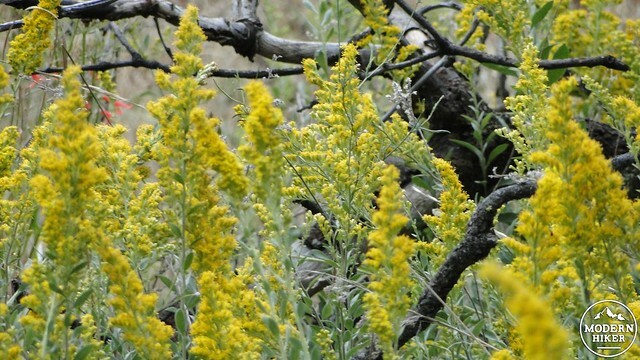 Aside from smelling really good, there’s some evidence that pinenes can help improve mood. Be aware that the woods at Wooded Hill might make you smile. The trail winds its way upward on a gently meandering slope to gain the 300′ of climbing required to reach the summit. Before long, you will come to a 4-way junction with a sign indicating basic directions for the short loop and the “long” loop. The short loop veering off at a 90′ angle to the right will lead back to the parking lot. 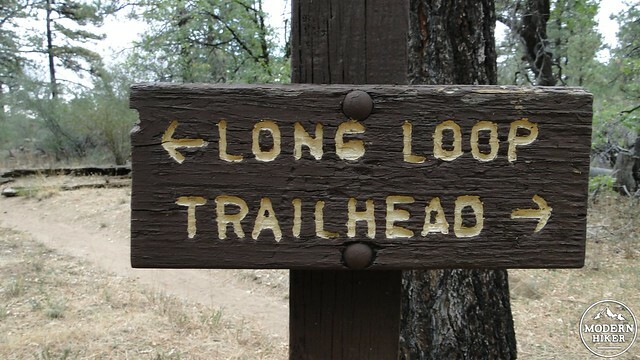 The long loop trail to the left will continue on toward the summit. Take that and continue climbing with the occasional pause to refer to the guide pamphlet or to admire the fall or spring color. The trail will remain mostly in the woods save for a few open spots on the south side of the hill. After the junction, you will wind around a little bit more before coming around one last bend to reach the summit. 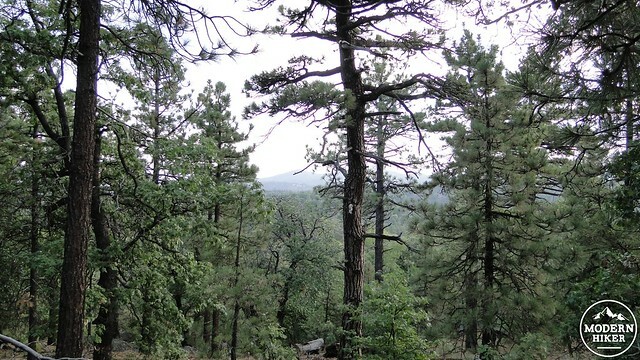 This summit has little in common with the majority of the summits in San Diego in that it is covered by trees on 3 out of 4 directions, with the south-facing slope covered in chaparral. This precludes the kind of panoramic view you might be hoping for. This is a mild disappointment, as the view would include sprawling Laguna Meadow and Cuyamaca State Park. Still, the view south toward Mexico and the Pine Creek Wilderness is pretty great. Sadly, my photos don’t fully represent the quality of the view as I shot them in the midst of a thuderstorm. After taking in the scene from one of the flat summit rocks, follow the continuation of the trail down the densely-forested north slope. This side of the hill will have the densest trees and the highest concentration of black oaks, and therefore the best fall color. The trail continues to meander through this lovely patch of forest before returning to the Short Loop/Long Loop junction. At this point, veer left to return to the parking lot. After a brief descent, you will emerge from the trees to the left from where you started. – You are required to display an Adventure Pass to park at the Wooded Hill trail. 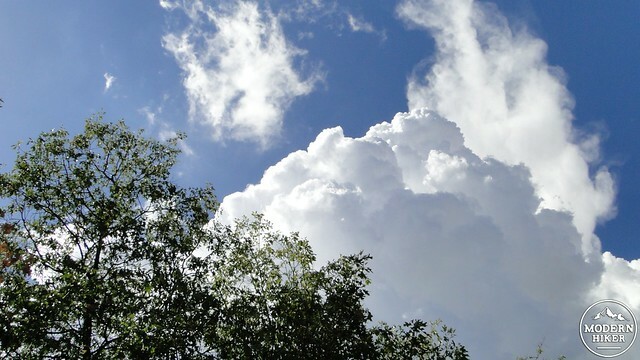 – While the trail does not technically connect to the Big Laguna Trail, it is possible to add Wooded Hill to the nearby 6 mile Agua Dulce Loop. Excellent. With the exception of a handful or rocky sections, the trail is smooth and easy to follow. There are two nearby traditional campgrounds: Burnt Rancheria and Laguna, with Burnt Rancheria being closest. There are also two groups campgrounds, El Prado and Wooded Hills, as well as one equestrian group campground at Horse Heaven. From San Diego, take I-8 east toward El Centro. Exit at Sunrise Highway and turn left. 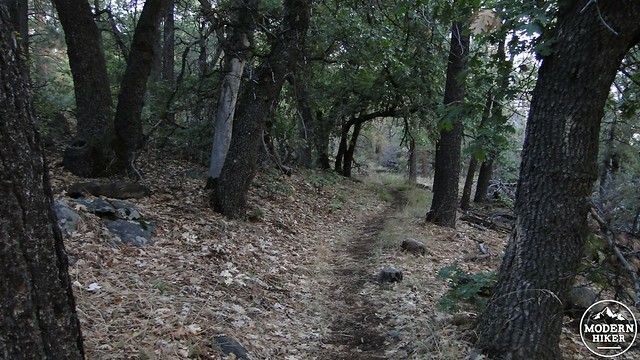 Follow Sunrise Highway into the Laguna Mountains, and take the left turn at Wooded Hill Road (look for the sign indicating the campground). Find the parking lot on the left, directly across from the Wooded Hills group campground.